Snowflakes Adopting Parents are usually matched with two or more embryos. When the embryos were created and subsequently frozen, each embryologist used his own methods to bring about the greatest success in thawing the embryos for a frozen embryo transfer. No one is able to determine if an embryo will or won’t survive the thawing before the thawing occurs. Unfortunately, not every embryo survives the thawing process. 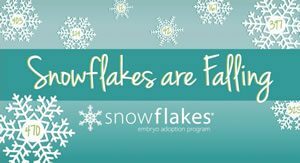 Recently Snowflakes was approached by an organization called Sacred Heart Guardians that has a program in place which allows families to choose to have any embryos that do not survive the thawing process to be buried. We would like you to know this no-fee option is available to you directly from the provider, should you have an interest in using it.